Known for fusing wearables and the latest technology, Anouk Wipprecht is no stranger to the fashion tech field. 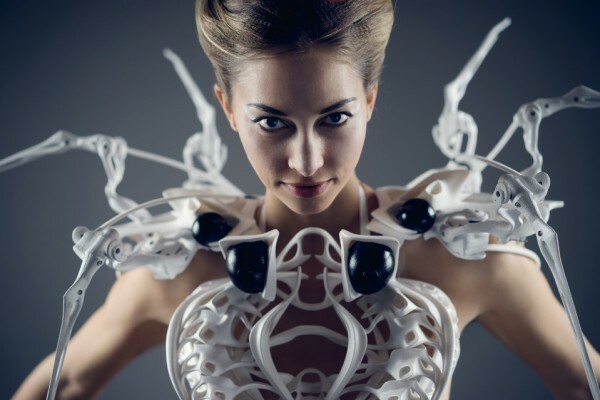 Her latest creation, the Spider Dress 2.0 is equipped with an Intel Edison chip that reads biosignals to defend the wearer’s personal space. Anouk used Materialise’s Magics software to create a watertight file so that the beautiful, complex design could be 3D printed flawlessly. And the result is amazing. The Spider Dress simulates a spider’s territorial instincts by using robotic arms that react according to data it picks up from motion and respiration sensors. When the wearer’s breath becomes heavy, the sensors read that she feels threatened, so the dress’s robotic arms will extend to defend her. Or if you approach the wearer in a quick, unexpected way, the defense mechanism will be triggered too. Once the threat has dissipated, the arms retract and the dress will have a softer expression. Anouk’s design, created in collaboration with Philip H. Wilck and fully 3D printed using laser sintering, is both unique and wearable. However, in order to make the complex spine-like geometry of the dress’s front printable, Anouk needed advanced software to fix the design files. Therefore, she used Materialise’s data preparation software package and STL editor Magics to fill up holes, fix bad edges and clear out all other defects in the STL files. The result was a solid file, without any errors that could damage the 3D print. Anouk has previously worked with Materialise when creating the Synapse Dress, Smoke Dress and Cirque du Soleil pieces. You can also come to Anouk’s keynote presentation at the Materialise World Conference in Brussels.